I was asked a week or two ago to write a book review by those lovely folk at Transworld Books. Even though the request came by e-mail, I still found myself looking idly over my shoulder (Mr Bean like) to see who they might be asking. 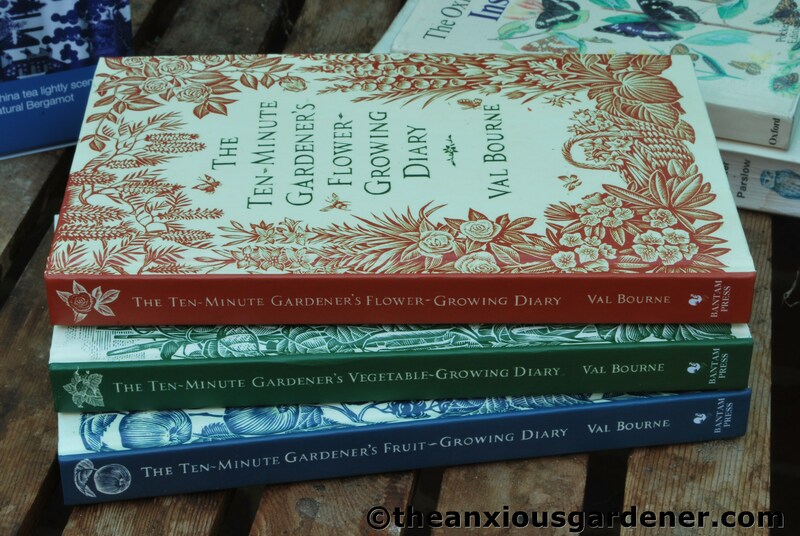 But, it was me and a few days later, I received copies of The Ten Minute Gardener’s Fruit, Flower and Vegetable Diaries by Val Bourne. The author writes for various publications, including: The Telegraph, Saga Magazine, The Oxford Times, Homes & Gardens and RHS The Garden. Sadly I don’t read any of these; not one and so consequently I hadn’t heard of Val Bourne before. 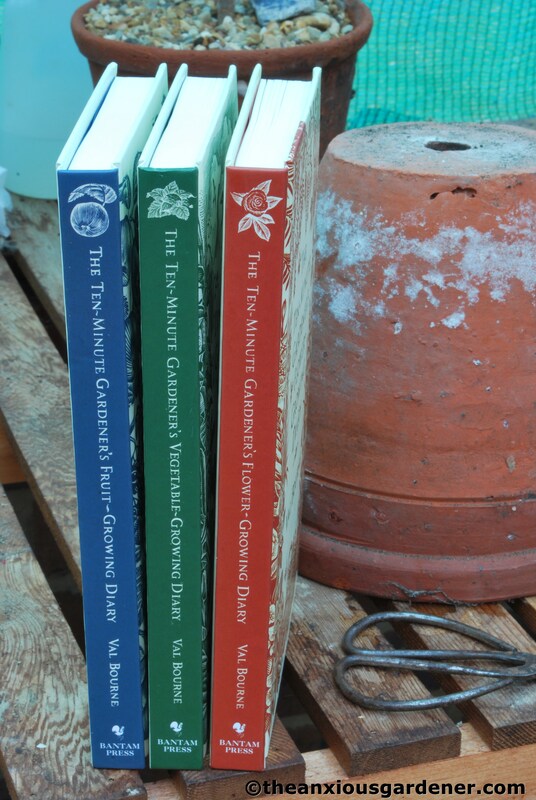 The books are ostensibly aimed at the novice but also seek to teach the experienced gardener certain techniques, facts and tips to follow throughout the gardening year. Each of the three books gives a variety of tasks and jobs that need to be done each month. So, for example, in the Flower Diary for April there are six tasks: cut down dogwoods and other winter stems, cut back penstemons and Mediterranean plants, divide and propagate perennials, cut back buddlejas, destroy slugs and snails and divide erthroniums. 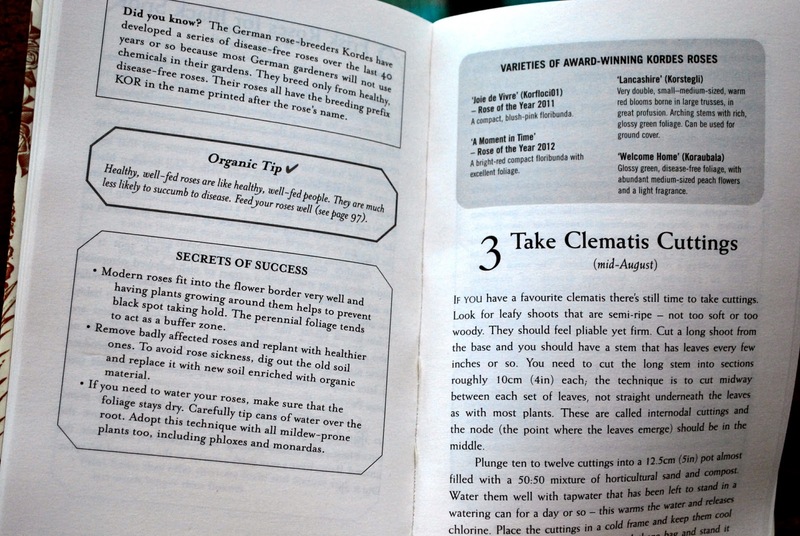 The tasks have detailed instructions and are accompanied by ‘Did you Know’ fact boxes, ‘Secrets of Success’ boxes and ‘Organic Tips.’ (Anything that blows the organic trumpet is a good thing in my view). The writing is clear and concise and delivers all that you need to know on the subject in hand. These aren’t diaries in the conventional sense; you’re not going to want to leap into bed and read them cover to cover. (Not like snuggling down with Monty Don and his ‘The Ivington Diaries,’ which despite intending to read in tandem with the unfurling of the year, I ended up snaffling in a few short days). No, you will want to dip into Val’s books all year round and be reminded of what you need to get on with. (I intend to move some herbaceous peonies and made a casual, mental note to check when would be the best time to do this. Then I happened to glance at jobs to do in October, in the Diaries, and saw ‘Divide and Move Peonies’ – mid October. Sigh – another job leapfrogs to the top of The List). I shall leave my copies in the greenhouse at the Priory and regularly check, over my morning cuppa, what’s next on the imminent list – and what I’ve forgotten to do. It was unfortunate that in checking a pet interest of mine (the making of leaf mould), I did find a mistake* but generally I was very impressed with these books and one line in particular struck a chord: “If you have a rose that’s a martyr to (black spot), don’t spray. Dig it up.” I instantly warmed to Val on reading this. I fail to understand why gardeners persist with growing varieties of rose that need spraying with noxious chemicals; chemicals that state quite clearly on the label that they kill bees. As if honeybees haven’t got enough problems. For goodness sake just replace it with a more resilient variety – there are plenty to choose from. Good for you, Val. As a little gripe, I would say that it would have been nice to have had some illustrations. The covers are adorned with beautiful woodcuts (I’m a sucker for a good woodcut) and it would have been nice to have had some of these inside the books. (There are next to no pictures). But that is just a little gripe. These are great little books, packed full of handy hints and information, with wipeable covers for muddy fingers and batting strongly for the organic team. What’s not to like? Ask nicely and you may get a volume or two in your Christmas stocking. Er, no. Not from me; from your loved one. Ask me again next year, when I know you a little better. * The Flower Diary for October states: “Certain leaves are slower at producing leaf litter: these include hazel, beech, oak and hornbeam. Others (like sycamore, horse-chestnut and lime) are much faster.” The two leaf groupings are actually the wrong way round; oak and beech break down relatively quickly. I don’t like to be pedantic but as a self-professed anorak-wearing-leaf-mould-making-geek, I simply can’t help myself on this occasion. Hi Mr K, would you be my agent, please? 50/50 – I'm not stingy. (And I'm sure any comments on this post are read by Transworld). Happy to do more reviews, it's just that they hinder what I really want to write abiout – The Priory, on which I've got a backlog of stuff. Dave: Send publishers a copy of your review. Point out you have had an overwhelming response from readers of your blog and they are all rushing out to buy the books. Then add – tentatively – suggestions made by your hundreds of readers as to how 2nd edition could be improved. Then ask what they would wish you review next. In the writing trade, you don't ask, you don't get. Hi Petra, I don't know. I haven't heard from the publishers. Am I mean to contact them, do you think? I've never done this before – and Ha! maybe I won't be doing it again. Goodness Sara, but I have a demanding (and expensive) readership! Happy birthday – in advance. 21, huh? The annoying thing is that it would be so easy to have one or two pages on how to adjust the 'to do' list according to latitude, height & soil, on a (relatively) scientific basis. I've long had a rule of thumb about such things to suit my own conditions, but a beginner up here might studiously follow the advice given in the book and be seriously disappointed…. Point worth making in yoour feedback to the publishers? 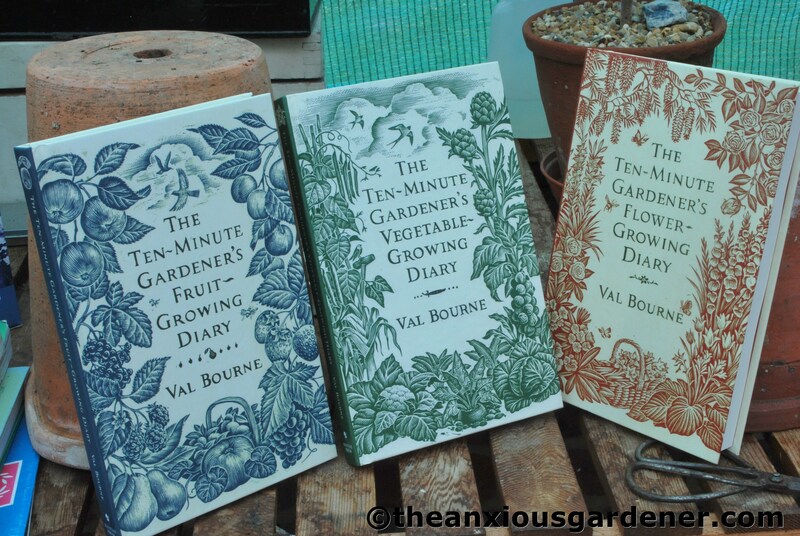 Books and gardening, two of my favourite things! Sounds like a great book/set thereof, and well presented. I love those cover illustrations, now forewarned not to be disappointed that there are no internal graphics to match. They must have been impressed and a tad embarrassed about your finding that error! You are Mr. Super Compost after all, on that note…..????? Hehehehehe! Thanks Shawn, very kind of you. Blimey GS – how different must that book have been to these ones? Massively, I should think. I checked out a month by month gardening book about New Mexico at the local library. By a different author of course, but it was so helpful to me. Glad to know your insight about this book. Being a 'niche' gardener it's good to dip into general/all round gardening from time to time, especially the basics, and sounds like this book is both informative and entertaining. Out and Proud, Janet. T-shirt? Brilliant idea – I shall get some knocked out forthwith. You're right about an ongoing reminder of one's shortcomings. As if I needed THAT! Glad you're not sulking – but pouting is good. Hi Mr K, your pet gripe goes unaddressed, I'm afraid – at least as far as I can see. I suppose books of this size can only ever act as a rough guide to what one ought to be getting on with. (As someone who gardens in the south, at sea level with relatively good soil it's obviously an assumption that has never annoyed me (and I was completely unaware of how annoying it must be for everybody else). As for the leaf mould – I will do a post re the making of it soon. As soon as it swings into full production in a week or two. Microwaving my leaf mould? It'd take me my whole life! Interesting idea, though. Perhaps we ought to microwave cow manure, garden compost, potting compost – the whole caboodle …. just to be on the safe side!! (My leaf mould produces quite a lot of hornbeam seedlings but I don't mind; they're pretty easy to get rid off. Wild raspberry sounds trickier). Hey Alberto, damn. I KNEW I should've stayed with my first draft – 'organic bugle.' But now that I realise how funny you find the words 'organic trumpet,' I shall use them in every post – just so you keep falling off your chair! …organic trumpet… seriously? I fell from the chair laughing! But apart from trumpets this was a good review. You have a future, man. Do the books take any account of latitude, height and soil types in compiling the 'to do' lists? It's a pet gripe of mine that such books all too often assume everyone lives in the south, at sea level, with quick-warming friable soil. So, can we have a post about making leafmould? I get most of mine, ready made, from a nearby beech wood – but it is always full of wild raspberry seeds. Some books say sterilise in the microwave – but that's ridiculous, surely? Well at least you are “out” as a leaf mould geek, not something that you should be hiding. Maybe you should have a T shirt made? Sorry, sniping because apparently you won't be buying me those books this year, and they sound really good. Yes, I am pouting a little too. Mind you, do I really need yet another reminder of all the things I should be doing and aren't? OK, not sulking any more.